Looking for something new to offer your group? Look no further! Club Alii Nui is Maui’s only “floating” Night Club. 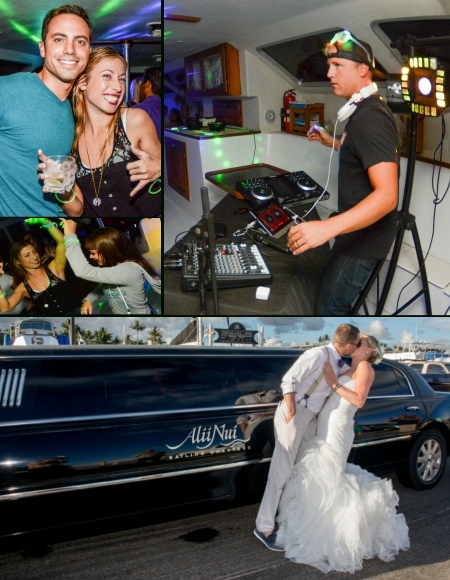 Dance to the music of one of Maui’s hottest DJ’s in our spacious cabin or enjoy star gazing on our outer deck areas. This is a great option for late night entertainment on Maui. Most events on Maui end at 10:00pm due to noise curfews or just timing in general. With Club Alii Nui, you can party any evening between 9:30pm and 1:00am without any noise restrictions. We are able to offer a unique, one of a kind experience for your clients. A full premium bar is offered with all your favorite libations and light snacks are included. Must be 21 years of age. You can also book a Sunset Sail and/or a Royal Feast and add the DJ for after dinner dancing! The options are limitless! Alii Nui is perfect for weddings, receptions, rehearsal dinners, birthday parties, family reunions and corporate events. Leave the driving to us! We encourage the use of our complimentary transportation. Experience the comfort and ease of our transportation service available from most south and west side resort areas. Our comfortable vans will pick up and return you to your hotel or condo in style. As an upgrade, we have our Alii Nui limousine available. Our limousine can accommodate up to 8 passengers. For more information and pricing, please call 808-270-9801.